If you are like me, then there is probably a good chance that you hopped on to some of your favorite financial web sites today to see just what was going on in the markets. Maybe you were flipping through the channels and just about dropped your drink when you saw that the DJIA was down almost 1,000 points. Maybe somebody sent you an email that said "Have you seen the markets today?" Whatever the situation may be, you likely hit Yahoo! 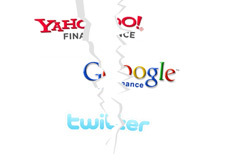 Finance or Google Finance to see just how bad the damage was to the markets. Unfortunately, these sites seem to have buckled under the strain as well today, seemingly unable to cope with the stampede of worried investors who were checking to see how their holdings were doing. At the height of the market turmoil today, I tried Yahoo! Finance. Down. After that, I decided to try my standby, Google Finance. The site, while not down, was giving me an error message. Even Twitter Search, which is my site of last resort when I am trying to get some receive some breaking news, was slow and glitchy. Sites such as Google and Yahoo! invest so much in their infrastructure, yet neither could handle today's increase in traffic to their finance sites. This made me wonder - what would happen if we had a meltdown similar to October 19th, 1987, when the markets ended up down over 20%? Could sites such as Google Finance and Yahoo! Finance handle the increased load, or would they break once again? If these sites did "break" for an extended period of time, how would you receive specific information regarding the current status of the stocks in your portfolio?